This sculpture is from the northern area of Thailand, known as the Lan Na kingdom. This area achieved political independence from about the 11th century, and evolved a sculptural style of its own. 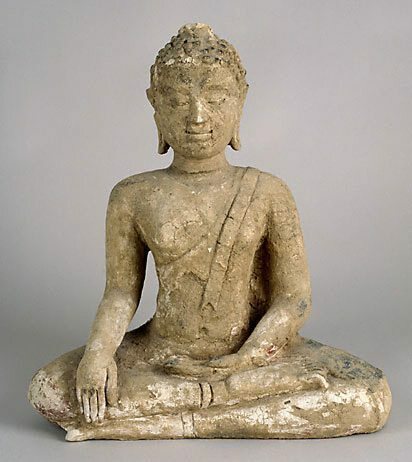 The most characteristic image of the Lan Na Thai style is the seated Buddha in the 'Maravijaya' attitude, his right hand touching the ground with the fingertips. Characteristically the body is perfectly upright, and he wears a robe that leaves the whole right side of his chest exposed, with a short flap folded over the left shoulder. Often his legs are in the 'virasana' pose as in this figure. Stucco was quite common as a material for Thai sculptures, the stucco a mixture of lime and sand in varying proportions.